WASHINGTON — The two companies responsible for producing chaff and flares for U.S. military aircraft could be poised for a major shakeup, and the Pentagon and congressional critics have begun sounding the alarm about this small, vulnerable segment of the defense-industrial base. In an October report to the White House on the health of the defense-industrial base, the Pentagon relayed concerns about the small number of domestic chaff and flare producers, and stated that weakened demand — especially for flares — could leave companies little incentive to make internal investments. The Trump administration's long-awaited defense industrial base report is finally out. Only one producer of chaff exists in the United States: Esterline Defense Technologies, also known as Armtec. Esterline, which also makes flares, is joined by one other domestic flare manufacturer: Kilgore Flares Co., a part of Chemring Countermeasures USA, which itself is a subsidiary of a firm based in the United Kingdom. This already precarious industrial situation may be further rattled by TransDigm Group Inc.’s proposed acquisition of Esterline, two lawmakers said. In an Oct. 29 letter to Defense Secretary Jim Mattis, Reps. Jackie Speier, D-Calif., and Walter Jones, R-NC, called on the Defense Department to block the deal until its inspector general completed an investigation into TransDigm’s business practices. The letter was first reported by The Capitol Forum. The industrial base issues, however, extend far beyond TransDigm’s proposed acquisition. Chaff and flare are countermeasures used by military planes and helicopters to help evade a missile attack by an enemy aircraft. For the non-stealthy fourth-generation assets that make up the bulk of the services’ inventory, these systems are pivotal to that aircraft’s defense. America's aging workforce could limit the Pentagon's ability to keep up with other nations, a new government report warns. 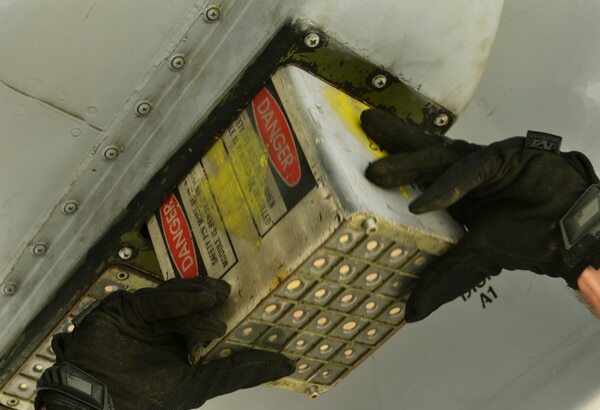 Chaff — which comprises “millions of tiny aluminum or zinc-coated fibers” — is stored onboard an aircraft in tubes and ejected behind the plane to confuse radar-guided missiles, the Pentagon’s defense-industrial base report stated. 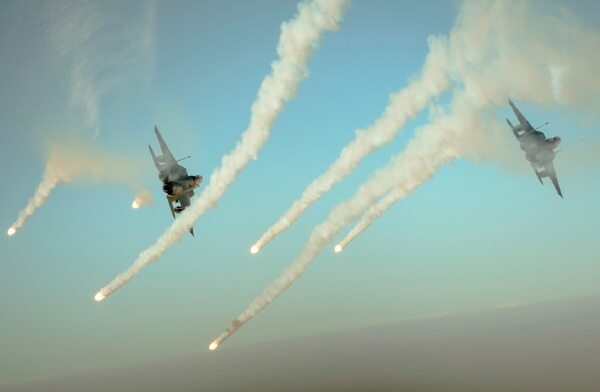 Meanwhile, flares distract heat-seeking, infrared-guided missiles “by ejecting magnesium pellets from tubes to ignite in the wake behind an aircraft,” the report states. Those pellets are so hot — more than 2,000 degrees Fahrenheit — that the temperature exceeds that of the aircraft’s engine or exhaust, tricking an infrared-guided missile about the path of the aircraft. Meanwhile, the outlook for flare companies seems even more grim, with the report noting a number of explosions that had plagued both Esterline and Kilgore over the past several years, often leading to factorywide shutdowns that delayed deliveries of product to the Defense Department. There are 300 critical weak spots for the defense-industrial base, per a U.S. government report. One of the biggest problems facing chaff and flare manufacturers is the fluctuating demand signal from the Defense Department — their only customer for the product — based on the military’s operational needs, the Association of Old Crows, a professional organization centered on electronic warfare and other countermeasures, said in a statement to Defense News. 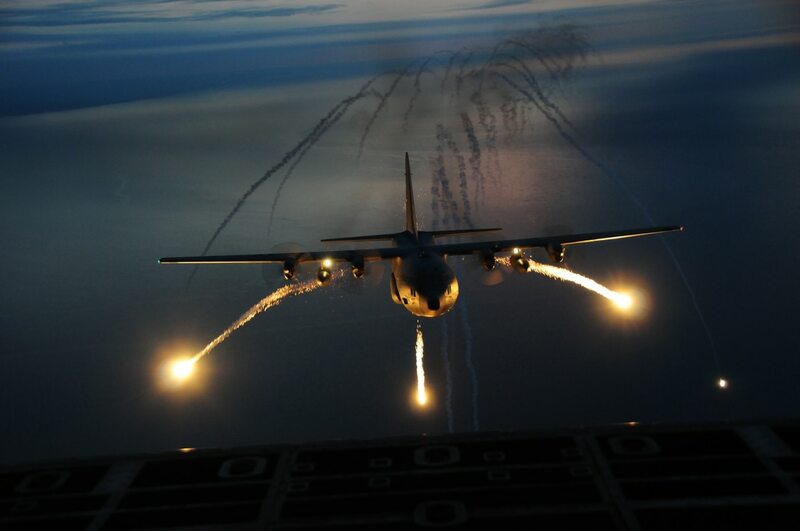 “Spending on countermeasures flares in the U.S. and among several NATO allies surged during Operation Enduring Freedom and Operation Iraqi Freedom and then dropped sharply as these conflicts reduced their operations tempo or wound down,” the organization stated. “The industrial base is small, yet it must be able to meet big fluctuations in customer demand. This creates a tremendous challenge that could be managed more successfully with better coordination among U.S. military customers or even between NATO partners." Though chaff and flare companies usually fly under the radar of the defense trade press, when they do appear in the media, it’s usually related to life-threatening accidents at manufacturing facilities or the like. In May 2016, Esterline was forced to temporarily halt operations at its plant in East Camden, Arkansas, after an explosion injured two employees. Local newspaper El Dorado News Times reported that one of the victims suffered “a blast to the face,” which left burns on the hands, chest and face, and took shrapnel to the elbow, according to a Facebook post by the victim’s relative. Kilgore Flares also sustained several high-profile accidents in recent years, most notably a 2014 explosion that killed one employee at its factory in Toone, Tennessee. The same plant was the site of a 2016 explosion where no one was injured, according to WBBJ 7 Eyewitness News. According to the Occupational Safety and Health Administration investigation of the 2014 incident, the worker had been removing residual flare materials that ignited, prompting the explosion. “The investigation identified noncompliance in process safety information, process hazard analysis and … operating procedures. The employee suffered severe burns on multiple areas of his body and was transported to a hospital, where he received medical treatment and burn therapy, but died from his injuries,” the administration had said. Kilgore also came under the scrutiny of the U.S. Justice Department in 2016 for selling the Army flares made with magnesium that a supplier — ESM Group Inc. — illegally imported from China. The company was fined $8 million for violating a requirement that all magnesium used to make flares be sourced from American or Canadian suppliers, reported the Memphis-based CBS affiliate WREG. Kilgore and Esterline did not respond to multiple requests for comment. DoD's Ellen Lord has a way to incentivize better contract performance, but industry is rebelling. Pat Kumashiro, former head of the maintenance division for the Air Force’s Logistics, Engineering and Force Protection Directorate and currently director of the Air Force market at LMI, said China is paying attention to weaknesses in the American defense-industrial base. “They are pretty savvy as it relates to understanding global supply chains, and when they have opportunities to buy mineral rights — and you see them doing a lot of work and being very aggressive in Africa — they are doing it for a reason,” he said. If an adversary such as Russia or China identifies that there are a limited number of sources for chaff and flare, they can find ways to impact U.S. suppliers — which in turn degrades the mission capability of fourth-generation planes, Kumashiro said. “Operational pilots are not going to go into harm’s way without an operational chaff [and] flare system,” he said. Big changes appear to be coming down the pipeline for both Esterline and Kilgore Flares. For the former, the question is whether the Defense Department allows TransDigm to acquire Esterline. "Our general goal in this area is to promote competition among contractors but also ensure that DoD is paying fair prices for the best, most usable products that it can get,” a staff member of Rep. Speier told Defense News. But Speier and his colleague Jones believe TransDigm could artificially inflate prices by claiming there is a commercial market for those products, which would limit the ability of Defense Department procurement officers to have full access to pricing data, the staffer said. Should the Defense Department decide to allow the TransDigm deal to go forward, Speier may push to add language to next year’s defense authorization bill that would pose additional limitations on what products are deemed “commercial,” or it could call on the Pentagon to study the level of competition throughout the industrial base, the staffer said. A Pentagon official sees challenges for international defense-industrial base cooperation. For Kilgore Flares, the changes appear to be more conventionally positive. This May, Chemring Group said it would spend $40 million to expand Kilgore’s production facility in Toone and grow the plant’s employment numbers from about 280 to 375 people. From 2018-2022, the company plans to improve existing facilities, construct new buildings and buy modern equipment, including a new flare extruder and assembly facility, the company said in a news release. In total, those expenditures will triple the plant’s production capacity. Kilgore’s investment may indicate that chaff and flare manufacturers see some relief on the horizon. Industry officials who spoke to Defense News about this sector said they were hopeful the Defense Department’s industrial base report could indicate a heightened level of Pentagon interest. The department already has certain levers it can pull to address problems in its supply base. One such effort, called the Industrial Base Analysis and Sustainment program, involves targeted investments to sustain certain manufacturers who produce a critical capability. Another resource is the Defense Production Act Title III program, which offers grants, purchase commitments, loans or loan guarantees to portions of the industrial base that are weakening. The Defense Department called for an expansion of those programs in recommendations to the White House submitted as part of the industrial base report. A classified annex also includes detailed fixes for certain critical industries. So far, however, it’s unclear what assistance could be coming down the pipeline for the chaff and flare industry.